This week I spoke with two interesting local characters, in fact, two jugglers. John Wee (Hermosa Native) and Owen Morse are not just the kind of guys that say they can throw two balls in the air to entertain a 4 year for 3 seconds, but the type of guys that command up to $40,000 per show for a corporate event. The passing Zone have been featured as a finalist on America's Got Talent, the comedy documentary The Aristocrats, and appeared on The Tonight Show with Johnny Carson several times. I had the chance to do a conference call with Jon and Owen as they frantically tossed jokes back and forth. Andrew: If somebody is not familiar with you, say they don't know what "The Passing Zone" even means, how would you describe yourself? Owen: It's the world's greatest comedy extravaganza. Jon: I don't know if it's the world's greatest? Owen: Okay, the universe's greatest. The universe. Jon: Yeah, that's probably more accurate. Andrew: How long have you guys been juggling together? Owen: We have been working together for 19 years. Jon: It doesn't feel like more than 18 1/2 though. Owen: We have been throwing things at each other longer than most married couples have been throwing things at each other. Andrew: [Laughs] Not a lot of people, when asked, say "I am going to be a juggler when I grow up." How did this happen? Jon: We each started in Junior High as a hobby and then it just got out of control. Owen is from Orange County and I grew up in Minnesota, and we actually met at a juggling convention. Andrew: There are conventions for juggling? Owen: If there is a convention for juggling there is a convention for everything. Jon: It's kind of like a star trek convention... but dorkier. Andrew: When you go to the convention are you like the "Kings" of the convention? Jon: Our corner of fame is among jugglers. If the rest of the world paid attention to juggling we would be like "Tiger Woods." Andrew: So you guys are golfers too? Owen: No, we are jugglers. "Tiger Woods" was a metaphor for being really good at something. Andrew: [laughs] Do you guys write all the material or did you guys hire writers? Jon: A couple lines here and there have been given, but most of it is ours. Andrew: What is the worst thing has happened while juggling? Jon: It actually happened at The Comedy & Magic Club. It was during a daytime kids show, so all these kids were sitting right by the stage on the floor. Owen: So I kick this bowling ball over my head, well that was the plan, and it sailed over my head and lands right in this girl's lap. Jon: She wasn't upset, she was just like here juggler boy here is your ball. We were terrified. Had the ball gone a foot further she, well, she wouldn't have given us the ball back. Owen: The police would have. Andrew: [laughs] Who was more shocked, the 5 year old girl or Mike Lacey's heart? Owen: I don't know if Mike was there, but Owen and I were shook up for months. Jon: That's one of the interesting things about The Comedy & Magic Club, not to scare anybody, but it is a difficult place for a juggling act. It is a pretty small stage and a pretty low ceiling. Owen: Challenging, but very exciting. Andrew: So you can assure people that they won't get a bowling ball in the face? Owen: Only every other show. Andrew: Juggling goes across all languages, so have you traveled all over the world? Jon: Yeah we really have, but we do have tons of comedy into the act. 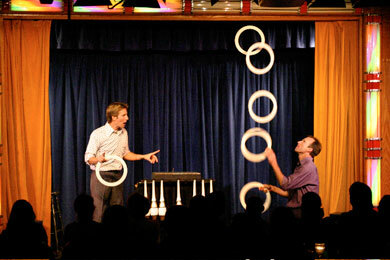 People have actually said to us that it isn't a juggling show and that it IS a comedy show. But we do have things on fire, and what not, so it is very visual. Owen: I would say that juggling is the international language. Jon: It pretty much is. Owen: Common knowledge. It is the one thing that makes us all relate as humans. Jon: We all are fighting gravity every moment of the day. Andrew: How many "items" can you juggle individually? Jon: I have done 7. Owen: I have successfully juggled 8, but it doesn't last very long. Andrew: I don't even know how you build that pattern, I don't see that is possible. Owen: 8 is 4 in each hand and you are throwing em pretty high. Andrew: What is the Guinness world record? Owen: I think 10 for balls and 11 for rings. Jon: We used to have the Guinnesss record for passing clubs, the bowling looking things, we set the record for that at 11 of those, and since that record was set some years back, and since then some Russian youngsters beat it. Andrew: What do you want people to take away from your show? Jon: Just to get people laughing and thinking wow what a great show. The Passing Zone will be headlining The Comedy & Magic Club on Thursday, March 26th - Saturday, March 28th 2009. Reservations Required (310) 372-1193 or comedyandmagicclub.com.